A dog holding an alms cup in its mouth. Often animals are used by beggars to draw sympathy from the public. 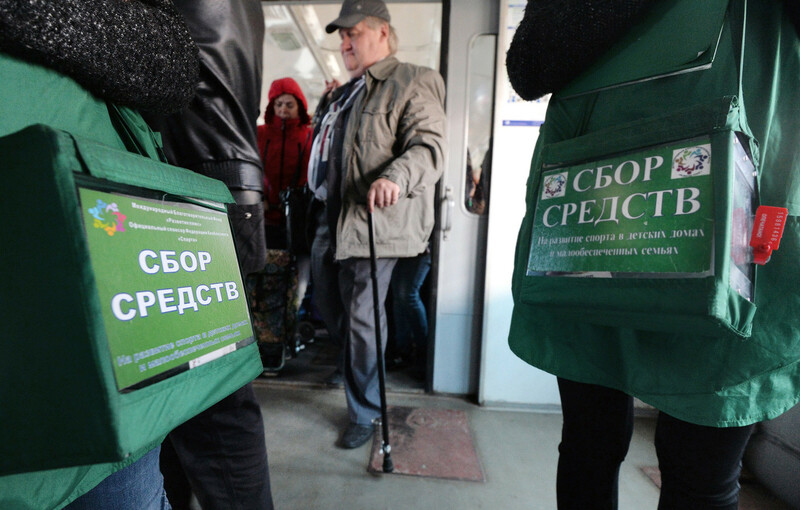 Helping others in need is good, but in Russia it can be easy to fall for a begger’s scam and misspend your donation. In Russian cities, it’s usually best not to give money to anyone begging in the street because many asking for cash aren’t what they seem. Here is a look at five types of panhandlers you’ll want to dodge, along with tips for better alternatives for charitable giving. A woman begging for money in the Moscow metro. People seeking help from a passersby come in the street in various guises: poor-looking grandmothers who “need money for an operation”; “war veterans” in military uniform, often missing limbs; and women, pregnant or carrying babies in their hands. The details differ but the pattern is the same — they all look so helpless you feel bad if you don’t give something. But often such individuals aren’t who they say they are. As the social-aid website Takie Dela (“So It Goes”) asserts, they may be part of a “beggars’ mafia,” turning over the money they collect to “curators” who provide for their needs. It’s a business, closely linked to crime, and supporting it is unwise. Advice: If you feel like helping such people, try to do so without giving money. Instead, offer what they claim they need (food, a bus or train ticket to their home city, etc.). If they are truly in need, they will take your help; the swindlers won’t. 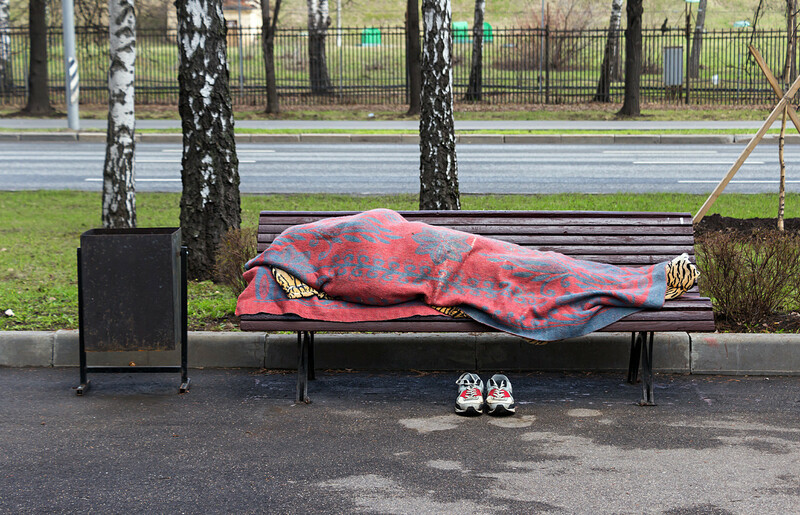 A homeless person sleeping on a bench near Sparrow Hills, Moscow. Being alone in a big city without a place to sleep or any food is a frightening notion, so it’s only natural to sympathize with the homeless, especially during the frigid Russian winter. However, this isn’t a good reason to give money to the homeless directly. You can’t be sure the money you’re being asked to give will go for food. Many homeless people have problems with alcohol and will spend whatever they get panhandling on the next bottle. This can prove dangerous: getting drunk outside in winter may cause a homeless person to lose consciousness and die from exposure to the cold. Advice: Buy a homeless person food yourself. Help them contact organizations that can provide shelter and connect them with social services. These respectable-looking people, often young, are out in public with boxes for collecting cash that’s ostensibly going to help an orphanage, an animal shelter or some other worthy cause. But they’re not really volunteers. At best, they’re collecting money for a questionable outfit that takes a huge chunk of donations for itself. Or there may be no “orphanage” at all, and those being paid as “volunteers” might not even know this. Even worse, the dogs such swindlers use for their scams are often drugged so that they remain calm and look doleful for passersby. Advice: Don’t give money to beggars with animals. 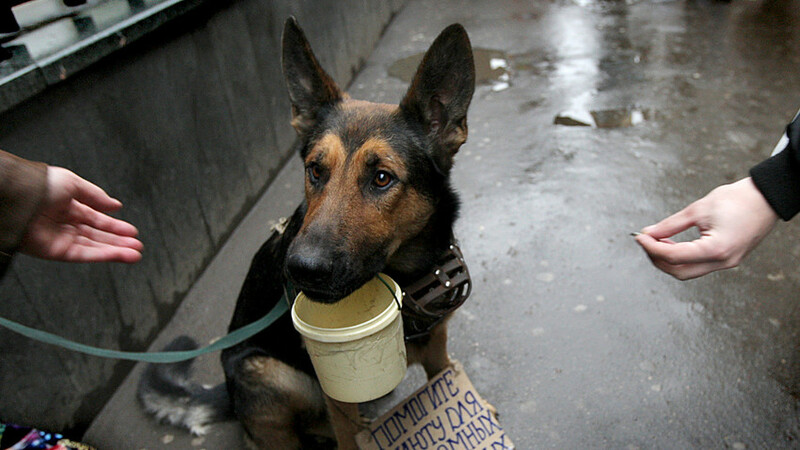 To help homeless animals, donate to a known charity such as Moscow-based PET. Text “SOBAKI” on your mobile phone (Russian numbers only) to 3443 and indicate the amount you want to donate, in rubles. A woman holding "help me to get home" sign. 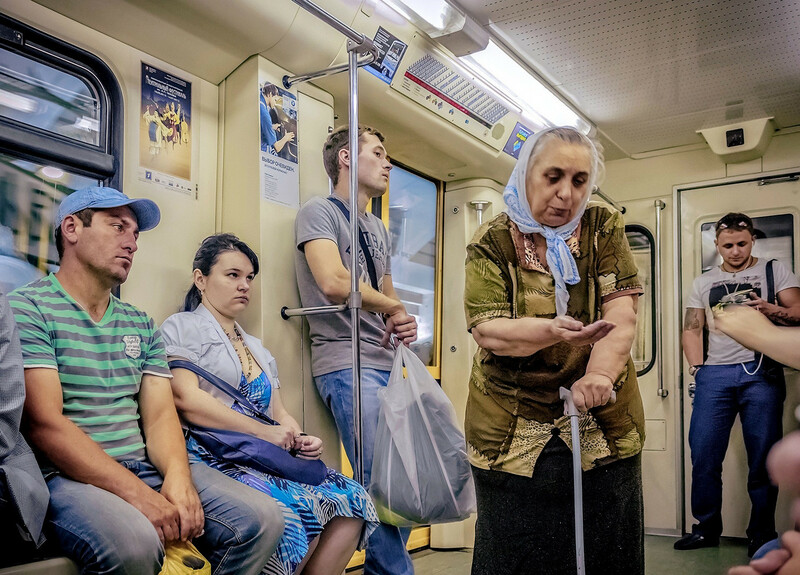 Be careful when someone comes to you with a modest request like a few dozen rubles for a bus or metro ride, especially if it’s an elderly person or a child. It’s not that they’re being fraudulent; it’s that such folks can be unaware of what they’re doing or where they’re going. Old people could be suffering from Alzheimer’s disease or other forms of dementia, and children may be lost and need other kinds of help. In a big city, both are vulnerable. Advice: Ask the person where they’re going. If they seem lost, contact LizaAlert, a nonprofit group that searches for and helps individuals who are lost, at +7 (800) 700-54-52. If you want to know more about Russia’s social problems, read our article on recent attacks on Russian schools.